Internet Explorer is, without a doubt, the browser that most Windows users know and one of Microsoft's "star" applications. Nevertheless, few users risk customizing it, possibly due to the complexity that this process implies. Without taking into account how difficult it is to fix if it suffers any damage due to a virus or any other kind of malicious application. 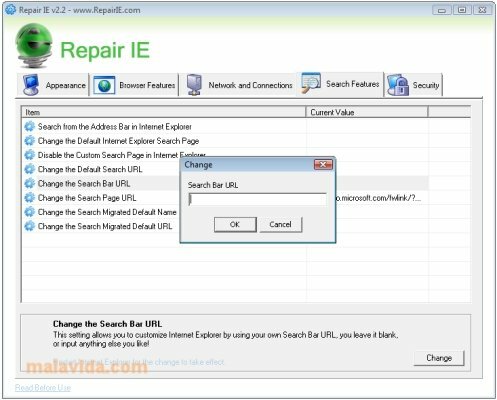 To make repairing Internet Explorer easier in case of malfunctioning we can use Repair IE. 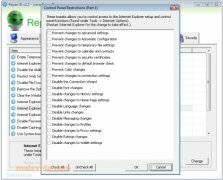 It is a utility that allows us to make modifications to the Windows Registry file to easily repair any errors that are associated to the browser and to be able to customize how the application works. - Change the download location of the ActiveX files. - Activate "My Images" bar in IE. - Open "Favorites" in a new window. - Deactivate the download notifications in the browser. - Change the "Autocomplete" mode. - Select the possibility to delete temporary files when IE closes down. - Automatically resize images in IE to screen resolution. - Change the URL that appears by default in the search bar. 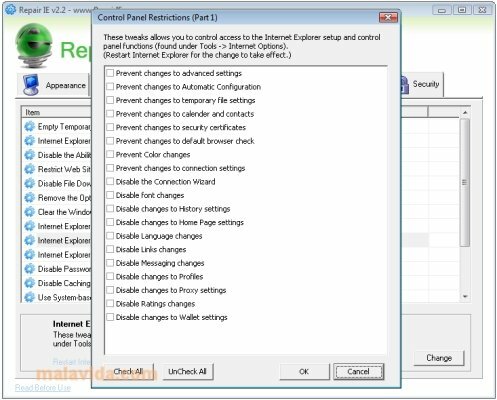 Thanks to Repair IE you'll be able to, without any need for advanced computing knowledge, repair and customize your favorite browser: Internet Explorer. This download requires a ZIP compatible compressor. Certain options don't run with the latest versions of Internet Explorer.